ARDSLEY, N.Y.--(BUSINESS WIRE)--Acorda Therapeutics, Inc. (Nasdaq:ACOR) today announced that the U.S. Food and Drug Administration approved INBRIJA™ for intermittent treatment of OFF episodes in people with Parkinson’s disease treated with carbidopa/levodopa. 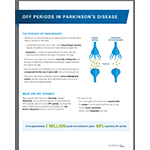 OFF episodes, also known as OFF periods, are defined as the return of Parkinson’s symptoms that result from low levels of dopamine between doses of oral carbidopa/levodopa, the standard oral baseline Parkinson’s treatment. FDA approval of INBRIJA was based on a clinical program that included approximately 900 people with Parkinson’s on a carbidopa/levodopa regimen experiencing OFF periods. INBRIJA is not to be used by patients who take or have taken a nonselective monoamine oxidase inhibitor such as phenelzine or tranylcypromine within the last two weeks. The Phase 3 pivotal efficacy trial – SPANSM-PD – was a 12-week, randomized, placebo controlled, double blind study evaluating the effectiveness of INBRIJA in patients with mild to moderate Parkinson’s experiencing OFF periods. The SPAN-PD trial met its primary endpoint, with patients showing a statistically significant improvement in motor function at the Week 12 visit, as measured by a reduction in Unified Parkinson’s Disease Rating Scale (UPDRS) Part III score for INBRIJA 84 mg (n=114) compared to placebo (n=112) at 30 minutes post-dose (-9.83 points and -5.91 points respectively; p=0.009). Onset of action was seen as early as 10 minutes. The most common adverse reactions with INBRIJA (at least 5% and greater than placebo) in the pivotal trial were cough (15% vs. 2%), upper respiratory tract infection (6% vs. 3%), nausea (5% vs. 3%) and sputum discolored (5% vs. 0%). INBRIJA was also studied in a Phase 3 long-term, active-controlled, randomized, open-label study (N=398) assessing safety and tolerability over one year. This study showed the average reduction in FEV1 (forced expiratory volume in 1 second) from baseline was the same (-0.1 L) for the INBRIJA and observational cohorts. Patients with chronic obstructive pulmonary disease (COPD), asthma, or other chronic respiratory disease within the last five years were excluded from this study. INBRIJA is expected to be commercially available by prescription in the U.S. in the first quarter of 2019 and will be distributed through a network of specialty pharmacies. pregnancy or plans to become pregnant. It is not known if INBRIJA will harm an unborn baby. breastfeeding or plans to breastfeed. Levodopa (the medicine in INBRIJA) can pass into breastmilk and it is unknown if it can harm the baby. No more than 1 dose (2 capsules) should be taken for any OFF period. No more than 5 doses (10 capsules) of INBRIJA should be taken in a day. INBRIJA is for oral inhalation only. INBRIJA capsules are not to be swallowed or opened. Patients are not to drive, operate machinery, or do other activities until they know how INBRIJA affects them. Sleepiness and falling asleep suddenly can happen as late as a year after treatment is started. falling asleep during normal daily activities (such as driving, doing physical tasks, using hazardous machinery, talking, or eating) and can be without warning. If patients become drowsy while using INBRIJA, they should not drive or do activities where they need to be alert. Chances of falling asleep during normal activities increases if patients take medicines that cause sleepiness. withdrawal-emergent hyperpyrexia and confusion (symptoms including fever, confusion, stiff muscles, and changes in breathing and heartbeat) in patients who suddenly lower or change their dose or stop using INBRIJA or carbidopa/levodopa medicines. low blood pressure with or without dizziness, fainting, nausea, and sweating. Patients should get up slowly after sitting or lying down. hallucinations and other psychosis – INBRIJA may cause or worsen psychotic symptoms including hallucinations (seeing/hearing things that are not real); confusion, disorientation, or disorganized thinking; trouble sleeping; dreaming a lot; being overly suspicious or feeling people want to harm them; believing things that are not real, acting aggressive, and feeling agitated/restless. unusual uncontrollable urges such as gambling, binge eating, shopping, and sexual urges has occurred in some people using medicines like INBRIJA. uncontrolled, sudden body movements (dyskinesia) may be caused or worsened by INBRIJA. INBRIJA may need to be stopped or other Parkinson’s medicines may need to be changed. 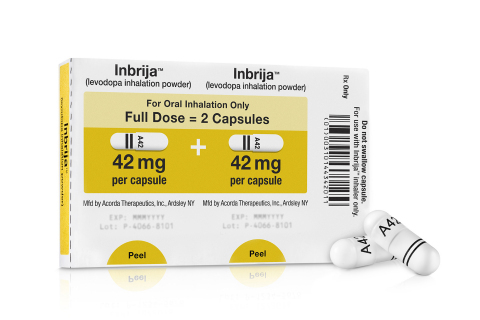 bronchospasm – people with asthma, COPD, or other lung diseases may wheeze or have difficulty breathing after inhaling INBRIJA. If patients have these symptoms, they should stop taking INBRIJA and call their healthcare provider or go to the nearest hospital emergency room right away. increased eye pressure in patients with glaucoma. Healthcare providers should monitor this. changes in certain lab values including liver tests. The most common side effects of INBRIJA include cough, upper respiratory tract infection, nausea, and change in the color of saliva or spit. Please see the accompanying Full Prescribing Information available at www.INBRIJA.com/prescribing-information.PDF. The company will host a conference call on Monday, December 24, 2018 at 8:30 a.m. ET. To participate in the conference call, please dial (833) 236-2756 (domestic) or (647) 689-4181 (international) and reference the access code 4049817. The presentation will also be available on the Investors section of www.acorda.com. A replay of the call will be available from 11:30 a.m. ET on December 24, 2018. To access the replay, please dial (800) 585-8367 (domestic) or (416) 621-4642 (international); reference code 4049817. The archived webcast will be available in the Investor Relations section of the Acorda website at www.acorda.com. 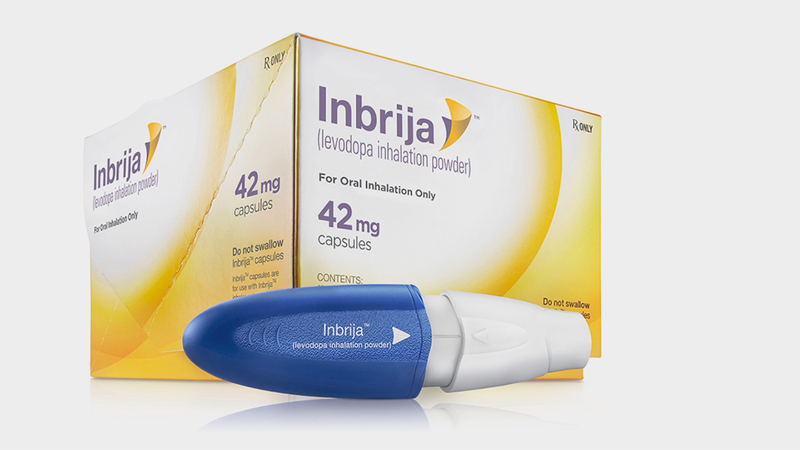 INBRIJA is the first and only inhaled levodopa for intermittent treatment of OFF episodes in patients with Parkinson’s disease treated with carbidopa/levodopa. 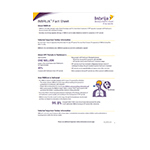 INBRIJA utilizes Acorda’s innovative ARCUS® platform for inhaled therapeutics. A Marketing Authorization Application (MAA) for INBRIJA was submitted to the European Medicines Agency (EMA) in March 2018 and was formally validated in May 2018. Parkinson’s is a progressive neurodegenerative disorder resulting from the gradual loss of certain neurons in the brain. These neurons are responsible for producing dopamine and that loss causes a range of symptoms including impaired movement, muscle stiffness and tremors. As Parkinson’s progresses, people are likely to experience OFF periods, which are characterized by the return of Parkinson’s symptoms, which can occur despite underlying baseline therapy. Approximately one million people in the U.S. and 1.2 million Europeans are diagnosed with Parkinson’s; it is estimated that approximately 40 percent of people with Parkinson’s in the U.S. experience OFF periods. The ARCUS Technology Platform allows systemic delivery of medication through inhalation, by transforming molecules into a light, porous dry powder. This allows delivery of substantially higher doses of medication than can be delivered via conventional dry powder technologies. ARCUS has the potential to be used in the development of a variety of inhaled medicines. Acorda acquired the ARCUS technology platform as part of the acquisition of Civitas Therapeutics in 2014. Acorda Therapeutics develops therapies to restore function and improve the lives of people with neurological disorders. 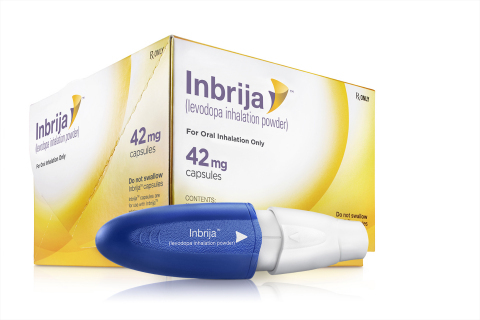 INBRIJA™ (levodopa inhalation powder) is approved for intermittent treatment of OFF episodes in patients with Parkinson’s disease treated with carbidopa/levodopa. INBRIJA utilizes Acorda’s innovative ARCUS® pulmonary delivery system, a technology platform designed to deliver medication through inhalation. Acorda also markets the branded AMPYRA® (dalfampridine) Extended Release Tablets, 10 mg. This press release includes forward-looking statements. All statements, other than statements of historical facts, regarding management's expectations, beliefs, goals, plans or prospects should be considered forward-looking. These statements are subject to risks and uncertainties that could cause actual results to differ materially, including: we may not be able to successfully market Inbrija or any other products under development; risks associated with complex, regulated manufacturing processes for pharmaceuticals, which could affect whether we have sufficient commercial supply of Inbrija to meet market demand; third party payers (including governmental agencies) may not reimburse for the use of Inbrija or our other products at acceptable rates or at all and may impose restrictive prior authorization requirements that limit or block prescriptions; competition for Inbrija, Ampyra and other products we may develop and market in the future, including increasing competition and accompanying loss of revenues in the U.S. from generic versions of Ampyra (dalfampridine) following our loss of patent exclusivity; the ability to realize the benefits anticipated from acquisitions, among other reasons because acquired development programs are generally subject to all the risks inherent in the drug development process and our knowledge of the risks specifically relevant to acquired programs generally improves over time; we may need to raise additional funds to finance our operations and may not be able to do so on acceptable terms; the risk of unfavorable results from future studies of Inbrija (levodopa inhalation powder) or from our other research and development programs, or any other acquired or in-licensed programs; the occurrence of adverse safety events with our products; the outcome (by judgment or settlement) and costs of legal, administrative or regulatory proceedings, investigations or inspections, including, without limitation, collective, representative or class action litigation; failure to protect our intellectual property, to defend against the intellectual property claims of others or to obtain third party intellectual property licenses needed for the commercialization of our products; and failure to comply with regulatory requirements could result in adverse action by regulatory agencies. These and other risks are described in greater detail in our filings with the Securities and Exchange Commission. We may not actually achieve the goals or plans described in our forward-looking statements, and investors should not place undue reliance on these statements. Forward-looking statements made in this press release are made only as of the date hereof, and we disclaim any intent or obligation to update any forward-looking statements as a result of developments occurring after the date of this press release. Acorda Therapeutics announces FDA approval of INBRIJA™ (levodopa inhalation powder).